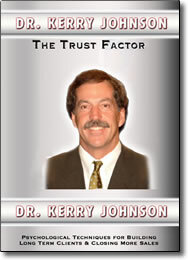 The Trust Factor – DVD by Kerry Johnson – Free Video Clip – Discount! Building trust and rapport has never played as important a role as it does in today’s business climate. People want to feel a true relationship with their sales representative, or they will simply go to the Internet and find a less expensive alternative. In this high-energy seminar, you’ll discover some of the most advanced techniques for quickly breaking the ice with your clients and connecting with them at a deeper level. Dr. Kerry Johnson will teach you the differences between the visual, the auditory, and the kinesthetic communication styles, and how to stay in rapport with each one. You’ll develop insights into the most persuasive words & colors to use in business. He’ll also show you how to increase the number of referrals you get by doing customer check-ups on a regular basis. Incorporating some neurolinguistic programming (NLP) techniques with a number of other interesting strategies for connecting more effectively with others, this program will definitely keep your attention.